Students at MIT and other universities all around Boston are getting in gear to help the victims of Hurricane Katrina. Some universities, including the University of Massachusetts system and Boston University, are offering open admissions to students at colleges in the affected areas. Other schools, including Harvard and MIT, will admit a limited number of students on a case-by-case basis. At MIT, fundraisering events have sprung up to help those suffering from the aftermath of one of the worst disasters in the U.S.’s history. Louis D. Fouche ’07, forced by Katrina to evacuate his home in New Orleans, has started a major effort to coordinate donations, events, and projects on campus. “We’re trying to unify the entire campus,” Fouche said. His group, which calls itself the MIT Hurricane Katrina Relief Initiative, will have booths in Lobby 10 starting tomorrow to collect donations, and is planning fundraising events over the next few weeks. “About 90 MIT students are from the region, and we are reaching out to them through their housemasters, deans and departments to offer support and advice in making it through this terribly difficult time,” wrote President Susan Hockfield in a message to the MIT community. Many other local colleges have also opened enrollment to a limited number of students. Harvard University will also match donations from students, faculty and staff of up to $100 to some charities. About 50 people, including Public Service Center Director Sally Susnowitz, attended a meeting to organize relief efforts around campus on short notice this Sunday, Fouche said. Many students have started to organize events on campus and still more are making donations — during a 40-minute interview, two students walked up to Fouche in a New House lounge to ask about contributing. The Relief Initiative will focus on three major areas: aid to victims of the hurricane, awareness, and how MIT community members can use their knowledge and experience to help the reconstruction effort. Upcoming efforts include a clothing drive, a food drive, a fundraising dinner, and a benefit concert with the Berklee College of Music, which will feature New Orleans-native music, he said. Fouche said it is important that interest in helping not fade away over time. “The reason we’re trying to get the whole of MIT involved is so that this doesn’t just die,” he said, referring to aid efforts on campus. 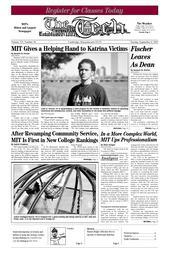 katrina/relief, and those interested in helping should e-mail katrina-relief at mit.edu. Are you planning a disaster relief effort or event that you would like listed in The Tech? If so, please e-mail news@the-tech.mit.edu.